We also offer 6 wheel All Terrain Vehicles including Max, Argo, Terra Tiger, Hustler, Amphicat, Attex, Sierra, Swamp Fox, Scrambler, Jiger, Coot, Sears, AMF and many more. Some of these machines will need a full rebuild, Others maybe new or like new. Please view photos and phone us if you have questions. Click on picture to see additional photos. 20 hp Kohler Command, winch, roll bar with seat belts, Route6x6'x shift improvement kit, new bead lock rims and new Rawhide style tires. We orignally sold this machine, now its back!. Super Clean! Ever wanted an amphibious trailer, but the 3000$ cost was too high? Here is a cheap project: guys in the past have cut the uprights off the MAX frame, installed a flat deck over frame add a front hitch and have a instant trailer! 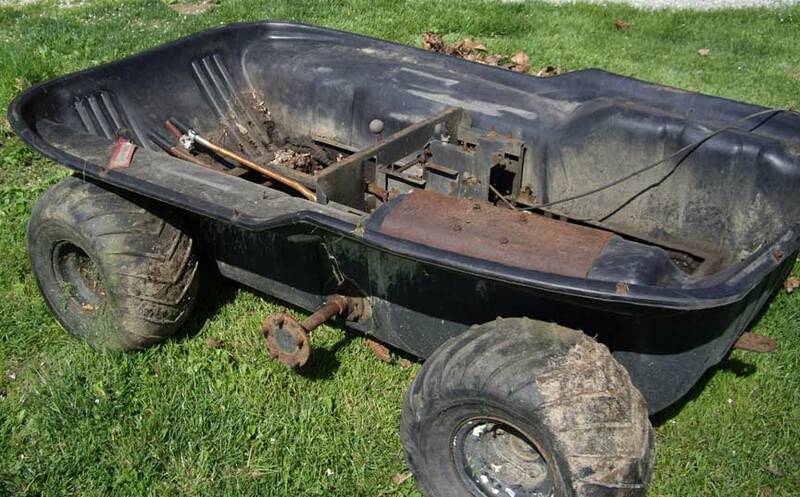 Good lower body, frame with axles, bearings, wheels, tires, everything You must come to southern Indiana to pick it up. Or unit can be used as a good MAX II part machine, still have sprockets ect. We are located in New Albany IN, which is in the Louisville KY metro area. Please call first and set up an appointment as we do not have store hours. As we sell parts mail order and deliver machines by appointment only We keep NO parts or machines at the New Albany IN address.